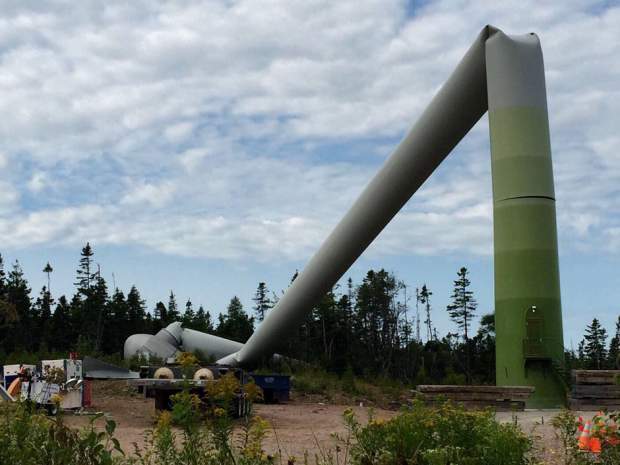 HALIFAX – Two investigations have been launched into the collapse of an 80-metre wind turbine in Cape Breton, believed to be the first catastrophic failure of its kind in Canada. Montreal-based Enercon Canada Inc. confirmed Wednesday that workers were told to leave the tower before it buckled and toppled into a tangled heap on Aug. 17. Spokeswoman Karine Asselin said it remains unclear what happened when Enercon employees were replacing a component as part of regular maintenance at the Point Tupper wind farm near Port Hawkesbury, N.S. The Canadian Wind Energy Association issued a statement saying it was not aware of a similar failure among the more than 6,000 wind turbines in Canada. Enercon Canada, a subsidiary of Enercon GmbH in Germany, said it has installed almost 1,000 wind turbines in seven provinces in the past 15 years, and this is the first time one of them has collapsed. “This incident did not occur during regular operations and is undoubtedly an isolated one,” Enercon said in a statement released Aug. 19. Nova Scotia’s Labour Department has started an investigation, and Enercon has dispatched a technical team to the site. The wind farm is owned and operated by Renewable Energy Services Ltd., based in Lower Sackville, N.S. Chief financial officer Kevin Doucette said he couldn’t comment on what happened because he was waiting for Enercon’s report. The 10 other E-82 turbines at the site, built in 2010, were not affected by the collapse, Doucette said. Each of the turbines can generate 2.05 megawatts of electricity. The tower that holds each E-82 turbine is about 80 metres tall, and the blades that extend from the turbine are about 40 metres long. That means the blades reach a maximum height of about 120 metres – about the height of a 40-storey building. Renewable Energy Services holds a majority stake in the project, which is co-owned by Nova Scotia Power Inc., the province’s privately owned electric utility. It’s rare for wind turbines to collapse, but it has happened. On Feb. 25, no one was injured when a 120-metre Vestas turbine fell in a field in Elkton, Mich., during a winter storm, the Detroit Free Press reports. The turbine was part of the Harvest I wind project built by U.S-based Exelon Corp.
At the time, a spokesman for Vestas said the collapse was a first in the United States for the company. Exelon operations manager Chris Higgins later said the turbine had spun out of control and “shook itself apart” after some seals failed amid high winds, the Associated Press reports. In January 2015, a 100-metre turbine fell over on a mountainside in Northern Ireland, the daily Telegraph reports. No one was injured at the Screggagh wind farm near in County Tyrone, but debris was scattered across the site. By the end of 2015, there were more than 300,000 wind turbines scattered around the world, according to the Global Energy Wind Council. “Collapses do occasionally happen, but they’re very rare when you consider how many of them are out there,” said Devin McCarthy, spokesman for the Canadian Electricity Association, which represents 37 of the country’s largest electricity companies.